Vive la Sape #1, 2008. Sapeurs posing in front of Memoria Savorgnan de Brazza, 2008. Eric Mazzakampa at Rapha Bounzeki's party, 2008. The Playboys of Bacongo, 2008. KVV Mouzieto the Sapeur Matsouaniste, 2008. Lahlande in front of a photo studio, 2008. Vues de Dos - Juin, 2003. Two Wives: Nollywood 11, 2010. "Africolor" - the exhibition - looks at the connections in photography between Africa, color, and color photography. While Africa as a subject has attracted and inspired photographers since the invention of photography, because of the obvious financial and technical issues involved – photographing Africa in the 19th century was largely a European endeavor. By the middle of the 20th century, however, photography both as a business and a means of artistic expression was beginning to flourish across the African continent. With the advent of color photography and in particular with the acceptance of color photography into the mainstream of fine art in the 1980s, the vivid colors and bright light of the continent seemed to serve as inspiration for a wide range of photography from the indigenous to the imagined and from documentary to staged. Celebrating the diversity of color photographic expression, "Africolor" presents groupings of work that are a compelling (but by no means comprehensive) sampling. The exhibition begins with a room of recent photographs by the Italian photojournalist Daniele Tamagni. In 2008, Tamagni traveled to the Atlantic coast of Africa to document the little known sub-culture of the sapeurs or La SAPE - a French acronym for La Societe des Ambianceurs et des Personnes Elegantes. The sapeurs sport ostentatiously dapper suits and fedoras. They have made fashion their religion, living an elegant lifestyle in direct reference to the French colonialism that contributed to the poverty of the Democratic Republic of the Congo. Sapeurism is a means of dealing with this past, by appropriating western style. A code of conduct dictates to sapeurs not to wear more than three colors in any outfit and to not only look but also to behave in an elegant manner. This work resulted in Tamagni's debut book, "Gentlemen of Bacongo" which became a seminal style volume. (The designer Paul Smith based an entire collection around the book.) "My aim," said Tamagni, "was to produce a portfolio which might generate a critical reflection about the identity of these people who consider elegance their main reason for existence inside a social reality so different and distant from our society." In 2010, Tamagni received the ICP Infinity Award for Applied/Fashion photography for the work. The second room of the gallery presents a sampling of work by six photographers - three African and three European – whose work connects to Africa and color but differs in many of the ways the medium allows. Malick Sidibe, the renowned Malian photographer, is noted for his pictures of local Malians which he began taking in the 1950s. In 1958, he opened his own studio (Studio Malick) in Bamako focusing in particular on the youth culture of the Malian capital. 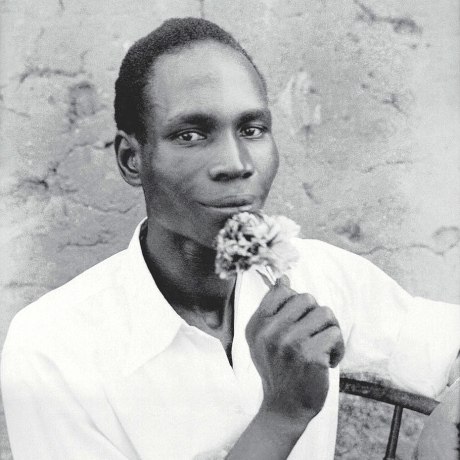 A naturally gifted artist Sidibe's reputation exploded when the first conferences on African photography were held in Mali in 1994. Sidibe's work is now exhibited worldwide. In 2003, he received the Hasselblad Award for photography, and in 2007, Sidibe was awarded the Venice Biennale's Golden Lion lifetime achievement award - the first time it had been presented to a photographer. While known as a black and white photographer, Sidibe has often presented his photographs in colorfully hand painted glass mounts and it is these "decorated" works, reflecting a particular palette and form, that are being shown. The Dutch photographer Ruud van Empel's pictures are both a dream of Africa and a meditation on the role of color in a racial as well as pictorial sense. Van Empel is known for taking digital manipulation of photography to a new level. He photographs professional child models in his studio along with detailed images of leaves, flowers, plants and animals. The pictures are then mixed and composed into Rousseau-like edenic settings using Photoshop. Mixing truth and fiction, innocence and danger, van Empel's work contains complex pictorial and political underpinnings while bursting with color. Lolo Veleko, a 33 year old South African, came to attention in ICP's 2006 exhibition "Snap Judgments" - a show of contemporary African photography. In Veleko's ongoing series "Beauty is in the Eye of the Beholder" her photographs capture the street fashion of today's Johannesburg youth in small but vibrant full length portraits. Veleko's portraits show her subjects to be highly individualized and independent and suggest an implicit collaboration between artist and sitter. There is nothing haphazard in the choices of dress or pose or in the execution of the photographs which present a vivid counterpoint to the traditional western photographic depiction of Africans and a reminder of the freshness and quality of work coming entirely from the African cultural tradition. Africa would seem to be a natural subject for Martin Parr. With his trademark acid color palette and boundless energy, Martin Parr has come to be seen as one of the freshest and most original voices in photography. Thus a fashion story for Rebel Magazine commissioned in 2001 became an opportunity for Parr to shoot high end clothing and accessories in the streets and on the locals of Dakar. For Parr, an ironist and a humorist as well as a colorist, fashion transcends geographic boundaries. In switching his focus between the refined creations of haute couture and the real world, Parr reminds us that no-one is immune from the influence of fashion and globalization. Samuel Fosso is another of Africa's most eminent photographers. Often described as "the African Cindy Sherman" for nearly 40 years Fosso has been using the camera to experiment with self-portraiture and identity dressing up (or down), posing in different guises, and re-creating other famous pictures. Fosso started taking self-portraits to send to his mother in Nigeria, from whom he was separated as a refugee fleeing the Biafran war in the late 1960s. Although his initial aim was to show he was alive and well, his interest in exploring the genre grew steadily, and he continually experimented with new techniques and poses. In 1994, he was discovered by chance by the French curator and gallerist Jean Marc Patras who brought Fosso's work to a wider audience and into the limelight of international critical attention. Fosso's work has been shown at The Guggenheim and in major museums around the world, but his local community in Bangui, Central African Republic, remains unaware of Fosso's success, a situation Fosso is keen to maintain. He is happy to keep his costumes out of sight and continue his passport and portrait photography business. His neighbors assume he travels to Europe to take wedding photos. Mickalene Thomas is a New York artist best known for her elaborate paintings composed of rhinestones, acrylic and enamel. Thomas was trained as a photographer and returns frequently to the medium influenced by sources as varied as the work of Seydou Keita and pin-up posters. Thomas's pieces in "Africolor" were directly inspired by Nollywood, the Nigerian film industry and continue her colorful exploratory mix of classical portraiture and pop culture. Considered one of the freshest voices of the contemporary art world Mickalene Thomas has had exhibitions at Santa Barbara Contemporary Arts Forum; The Museum of Contemporary Art in Detroit; The Studio Museum in Harlem; and P.S.1/MoMA. She is currently the artist in residence at The Versailles Foundation Munn Artists Program in Giverny, France. The show concludes with a large single piece by JR, the street artist who has mounted his guerilla-style installations of photographs all over the world. The piece we are showing records a project, "Women Are Heroes", where JR photographed women living in Kenya's Kibera slum. He returned a month later with enormous blow-ups of their faces printed on waterproof vinyl material which was then applied to dilapidated railway trucks and leaky tin roofs, ensuring that his art intervention had a practical purpose. In 2011 JR received the TED prize - awarded in the past to figures like Bill Clinton, Bono and the biologist E. O. Wilson. He is using the $100,000 to create a large-scale participatory art project where people are encouraged to make black and white portraits and send them in to insideoutproject.net. The digitally uploaded images are then made into posters and sent back to the creator to exhibit in their own communities wherever and however they want. The installations will then be documented, archived, and put on view on the web.